Candidate Rev. Theresa Soto has sojourned with the First Unitarian Church of Oakland from Saturday April 27 thru Sunday May 5th. Sunday, May 5th, Rev. Soto will offer their final sermon before the congregation takes a vote to call Rev. Soto as their next settled … read more. Ministerial Candidate, Rev.Theresa Soto has sojourned with the members, friends and allies at First Unitarian Church of Oakland, from Saturday April 27 thru Sunday May 5th. This Sunday they offer their final sermon before the congregation takes a vote to call Rev. Soto as their … read more. Welcome, Rev. Theresa Soto, the ministerial candidate at First Unitarian Church of Oakland. Rev. Soto uses the pronouns, they, them and theirs.They will offer the first of two sermons Sunday, April 28. Members, friends and allies please come meet Rev. Soto. The sermon title is, … read more. The Liturgical Power of Church. Liturgy literally means “the work of the people.” What is the work of the people? Church offers every willing soul a place where we can breathe in and be “in-spired”; opportunities to breathe out and cast off or “ex-pire” what … read more. In celebration of Women’s History Month please join Daisy Quan, Worship Associate Kate Lenhardt, and Pastor Jacqueline as diverse female identified persons tell stories about their relationships with Ms. Authority. Crescendo Choir and Joyful Noise under the direction of Renee Witon and Stefan Schneider will … read more. The word incarnate literally means “to make flesh.” How do we put flesh on the bones of our activism so that it makes a real difference. Bryan Stevenson, founder of the Equal Justice Initiative and author of Just Mercy states that there are four elements that make his social change work real and present or incarnate in the world. The four are: proximity, narrative, discomfort and hope. On this Sunday honoring the Rev. Dr. Martin Luther King Jr, let us come together and explore an additional pathway for our activism. Crescendo Choir will offer us songs from the Civil Rights Movement. Our youth and children will spread poppy seeds and pennies throughout our neighborhood. This is a multi-generational worship service. All are worthy and all are welcome. Please join us. “Tolling of the Bells: The Spirit Remains”. 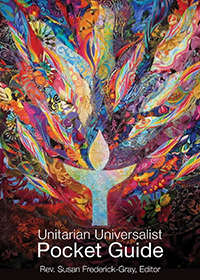 Two of the big questions religions have sought to answer are: “Why does life exist as we know it?” and “What happens after we die?” Unitarian Universalism does not have THE ultimate answer to either of these questions. … read more. “Sustenance for Our Souls”. This Bread Communion Sunday, Crescendo Choir will bless us with music that embodies the spirit of our most sacred values. The first line of one of the songs reads “For everyone born: a place at the table. For everyone born: clean … read more. Music has the power to soothe, excite, heal, motivate, and inspire us. Our guest speaker Conductor Michael Morgan, Musical Director of the Oakland Symphony, will share with us how music has the power to bring us together across all that can divide us. As … read more.